This is what we do for a living, this is recycling. This stuff get from the dumpside. In the evening we bring it here, we recycle, we have to separate, green bottles, they must be separated. So, that when you go to sell it, they can recycle it according to the colors. So, this is how we live in fact, we are only depending on such things. There’s nowhere we can find a job. It’s better to help government recycling like this. Because there’s noone who can do this. Welcome to the Plastisphere, the podcast on plastic, people, and the planet. My name is Anja Krieger. Plastic has been leaking into the environment for many decades but it’s only now that we realize to what extent and what the consequences may be. Where does it all come from? What does it do to us and our environment? And how can we stop it? That’s what I want to explore in this podcast. When you hear the term “waste management”, what do you think about? I think of the trash in my home and in my yard, and the garbage trucks humming outside my window to pick it up. I imagine they will take it to big and modern places to recycle or burn it. That’s what it looks like where I live – in the city of Berlin in Germany. But a lot of the world’s waste isn’t taken care of by modern trucks, machines and advanced technology. In low-income countries, over 90 percent of all waste ends up in unregulated dumps or is burned in the open, a World Bank study has found. And this mismanaged waste pollutes the soils, rivers, air, and oceans. It’s quite staggering just how much trash we produce. Not only plastic, but many other things. The cities of the world produce over 2 billion tonnes of solid waste each year – and this might increase by another 70 percent in just a few decades. If the World Bank is right, we might produce so much trash in the year 2050, that it would equal the weight of 15 thousand cruise ships. And this is just in one year. How can we take care of our waste, and stop the flow of plastic into the environment? I recently had the chance to talk to two of the women who are digging into this, Dr. Jenna Jambeck and her PhD student Amy Brooks from the University of Georgia. Hello? Just a minute. Hello? Hi! Jenna is an environmental engineer and waste management expert. She has led one of the most important estimates on ocean plastics. The researchers found that in 2010 alone, between 4 and 13 million tons of plastic were lost from coastlines and leaked into the oceans. Her research also shows that the issue is especially pressing in certain Asian countries. A disproportionate amount of plastic enters the oceans from there. This led her and Amy to Vietnam to study the situation. I called them in their hotel room in Hanoi, after a busy week of research, to ask them what they had seen. There’s a fair amount of mismanaged waste here. There’s sort of really rapid economic growth so a lot of folks can now afford to go to coffee shops, there’s a lot of single use plastic through, let’s say, a cup, a lid and a straw and then there’s a large motor bike culture here lots of people ride motorbikes because it’s an easy way to get around and so they’ll even put this whole cup straw lid in a plastic bag so that you can carry it on the motorbike. And you know, honestly, just the rapid increase in the use of plastic and then sort of this consumerism, the waste management infrastructure just hasn’t been able to keep up with that. 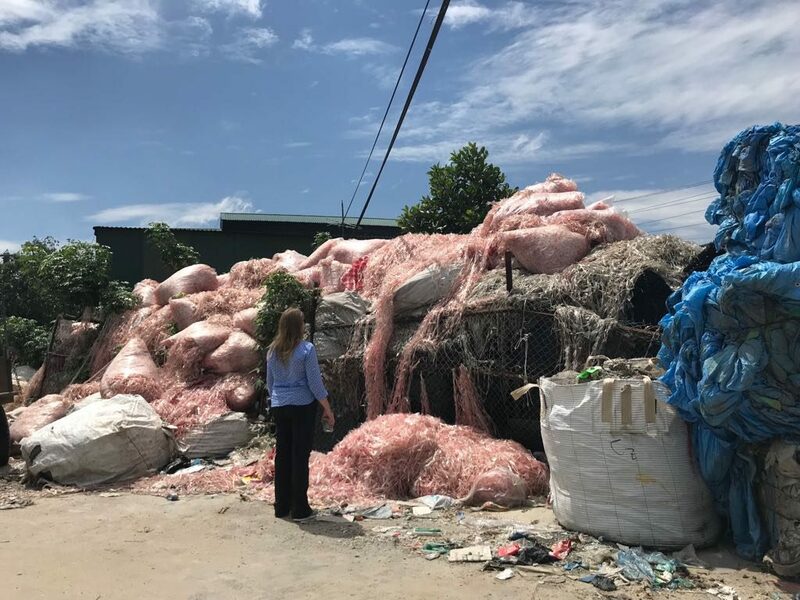 According to research conducted by Jenna and her colleagues, Vietnam is one of the countries that loses the biggest amounts of plastic into the ocean. The top polluter is China, followed by Indonesia, the Philippines – and then Vietnam. It’s the booming economies of Asia. Yes, one component of it is just the waste that’s generated by all of this economic growth which increases waste generation within the country and then not having full collection and management of that waste. But that’s one component. Now with the the import ban in China in some cases it’s being stockpiled in the countries that were exporting, but it’s also now going to other countries like Vietnam. They’ve seen an increase in this importation of waste that used to be going to China. We used United Nations commodity trade data for different polymers of plastic, and we used country-based data using quantities and trade value, and what we found is that overwhelmingly, it’s high income wealthy nations that are sending their plastic waste to other nations that may or may not actually have the waste management infrastructure to properly manage that waste. Amy told me that 90 percent of this waste is comprised of single-use plastic – polymers that are typically used for throwaway items. A lot of this went to China in the past. But as the impacts on health and the environment became clearer, China changed its policy. The world’s biggest plastic-waste importer implemented a ban called the “National Sword”. This policy completely disrupted the market, as China stopped importing all non-industrial plastic waste. Amy and Jenna have calculated that this ban would affect over 100 million tons of plastic until 2030. Where will this trash go to now? One answer might be Vietnam. 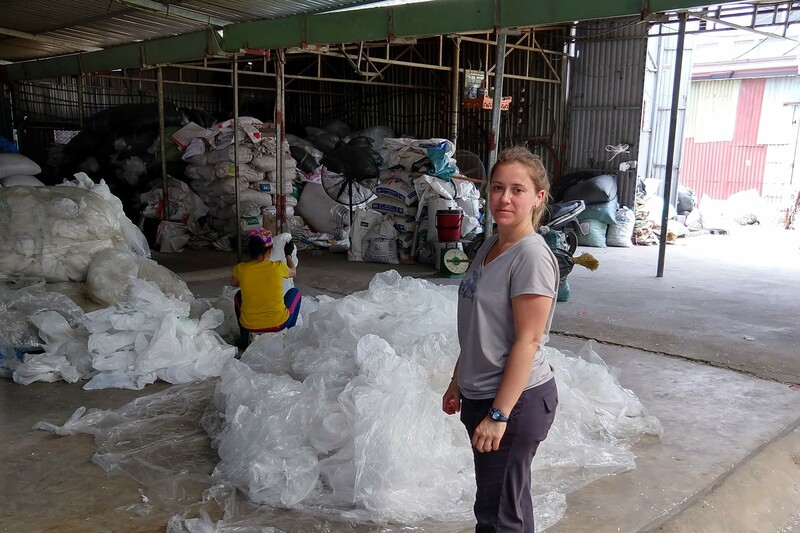 We came across some plastic film sorting… women that were sorting plastic film bales and found labels that were from international companies and so they told us that they had gotten the plastic waste from imported… or from a port on the coast here. And so it was really powerful for me after having written the import paper to see actual plastic waste here being sorted by hand in conditions that weren’t necessarily safe, very little protective gear. And seeing the women there, of course, very powerful. And one thing we’ve been talking about a lot here is how we can move forward with solutions for this issue. 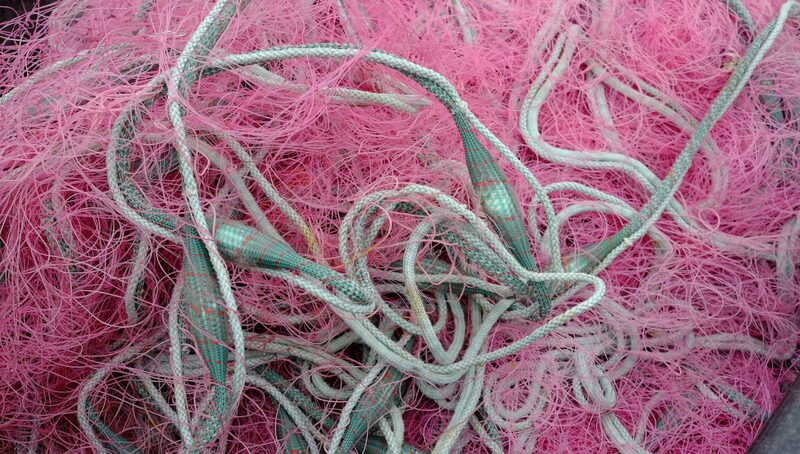 So we know a lot of plastic enters the oceans from Asia. We know that this region is experiencing an economic boom. We also know that its waste management systems lag behind. So do these countries just need to modernize their infrastructure, so that it works like it does in the richer economies? Jenna and Amy got to take a look at the current way the waste management system works in Vietnam. There’s a few sectors that are sort of outside the government within Ho Chi Minh City. There’s the independent waste collector sector and they are paid directly by homeowners to collect the waste in the back streets of Ho Chi Minh City where the streets are very narrow and the municipal vehicles can’t get down. So, they’re paid directly from the home owners, they usually work every single day, eight hours a day collecting the waste. They’ll take out items that are recyclable and sort of stockpile those until they have enough to sell and make some more money. So they kind of supplement their income from the homeowner by selling recyclables as well. Because each homeowner pays not even, it’s less than a dollar per month for this every single day waste collection from these independent collectors. Outside of that, there’s also an informal waste sector within the city. And those are usually comprised of waste pickers and so those are people who sometimes negotiate directly with businesses, and also pick through trash that is is put into sort of public places for them to take recyclables and then sell them to the junk shops that are mostly outside the city. Jenna and Amy are now working with several NGOs, non-governmental organizations, within Vietnam that focus on solid waste management. The researchers want to help better document the independent waste collectors who work in Ho Chi Minh City. It’s estimated that they take care of as much as 65 to 70 per cent of the waste within that city. Jenna told me that they are fairly unrecognized for the work that they do. Probably, you know, hundreds of thousands and millions of people around the world certainly make their living from these informal sectors, waste being one of them, and so I think it’s very important when you look at solutions that you look at incorporating them and hearing from them directly on what, how they foresee their livelihood continuing. But you know in many cases these folks are working in conditions that are not… they’re not… you know, they… the health and safety protections are not there, the environmental protections are not there. So if we could improve that, you know, that could go a long way to like you said sort of formalizing this sector but in a way that is sensitive to their economic livelihood. Jenna and Amy made me aware of this human dimension of waste and plastic. It’s hard to say for sure how many people depend on waste as their income. It could be up to 15 or 20 million people world-wide, and economically impact even more. Wiego is a network that supports workers in the informal sector. To learn more, I called their expert on waste, Sonia Maria Dias. She lives in Belo Horizonte in Brasil where plastic pollution is also a big issue. Yeah, yeah, you know, we have a main river that runs through the city and you can see it, people dumping plastic waste on the river and also, you know, on the streets, it’s a pervasive problem. Belo Horizonte is a planned city of almost six million residents, with a pretty good infrastructure. But in the 1980s, Sonia started working in the shantytowns, where the poor people lived. The provincial and municipal government had set up a program to work on upgrading the urban infrastructure there. They sent a team of engineers, architects and sociologists like Sonia to look at the issues there. One of them was waste. At that time we had a very good coverage of door to door collection of domestic waste in the formal city, okay? But in the shantytowns, we only had containers in certain areas, which the shantytown residents had to come from their houses and dispose their waste in these containers. So most often because collection was not done door to door in the shantytowns, they just threw waste anywhere, you know, in the cliffs, in the streets. So it was a terrible situation back then. For Sonia, working in the shantytown was an eye-opener. She had studied sociology but never really known what her purpose was. Now she had found her calling – garbology, the social study of garbage! 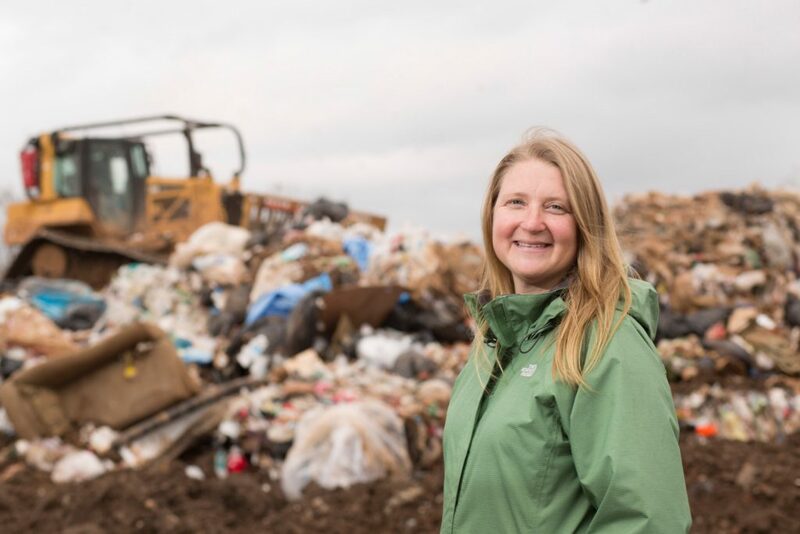 Waste is such a fascinating issue because you can…you deal with issues that, apparently, they are technical, but there’s a lot of class issues that comes with it. Why, you know, people live in a given area in which they don’t have access to urban services. Why some people need to collect recyclables to earn a living. So I became more and more involved with waste in general. And it took me just a while until I kind of spotted those people who really earned their livelihood by collecting what we had cast away, you know, as waste. But they could make, you know, they could repurpose and give a different life to the materials, the recyclables that were thrown away. It was the waste pickers who helped keep the cities clean. But their life was hard. They were marginalized, stigmatized, chased off the streets and threatened by the police. They had no infrastructure. Until, in the late 1980s, a movement started. A group of waste pickers started to organize. Among them was Dona Geralda. She started working in the streets at the age of, I think she was 15 or 16 and she was illiterate at the time and she had, you know, at a certain point she had nine children that she had to feed, and she worked collecting recyclables. And she was subject to the persecution of the police. But by 1988 she got involved with an NGO called Pastoral de Rua that was helping wastepickers in my city to get organized. And together with ten other informal recyclers, they created the first wastepicker association in Belo Horizonte and the second in Brazil. And they squatted a derelict area, and they organized many public demonstrations to attract attention of the citizens and attract attention of the municipality that they were providing, you know, a valuable work for the city. Just like in Belo Horizonte, waste pickers have organized in cities around the world, from Bogotá to Buenos Aires and the Indian city of Pune. And they have been able to build bridges with the government, to establish collaborations between the informal an formal waste sectors. In the case of Bogotá, the waste pickers’ right to inclusion in city planning was even recognized by the Constitutional Court. But the workers’ conditions are still difficult. They live in, usually, in informal settlements, with no access of sometimes electricity, good roads and the only work they have access to, is collection of recyclables. This is a situation there. It happens everywhere, you know, most waste pickers, you know, they face numerous challenges. Most of them they are illiterate, some of them might be working in open dumps, in terrible conditions and some being run by vehicles, because if you work in an open dump, you are working in an environment that it’s absolutely, you know, dangerous. And conditions waste pickers face, it’s really harsh, everywhere in the world. Sonia says one of the biggest risks waste pickers face is the privatization of the waste management sector – when their means for making a living are taken away. Well, Cairo is a very good example. They actually privatized the waste collection in Cairo, and they actually drove away, you know, thousands of zabaleens, who were doing an efficient collection of recyclables. So this is happening everywhere, if you go to Bogota, they try to privatize the collection of waste ten years ago and ignoring the recyclers that had been doing this work. it’s happening everywhere, you know. Apart from a few cities that are trying to come up with a concept, and the practice of inclusive recycling, privatization is one of the biggest threats that we have. Together with other researchers, Sonia is now working on studies that can really show the contribution these workers are making. In a project called “Coastal Cities”, they want to quantify how much greenhouse gases are saved by their work. 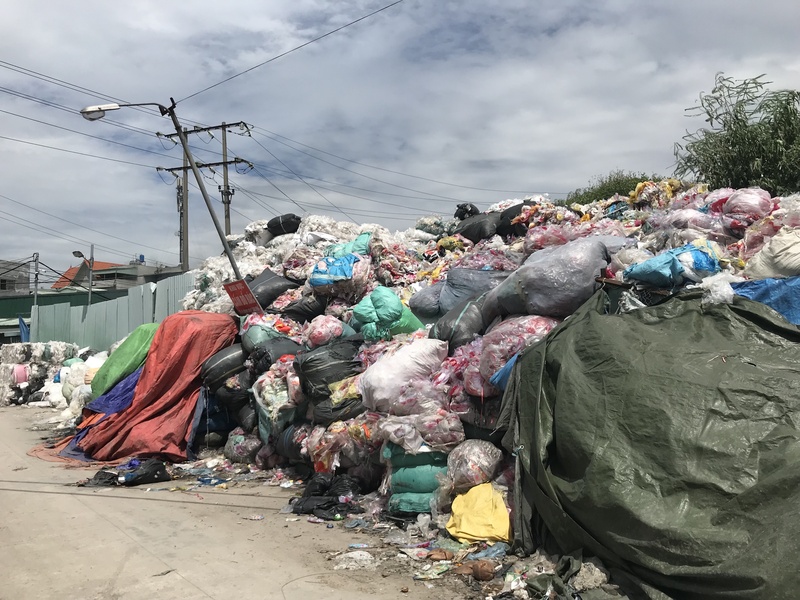 But wait…if the waste pickers are already doing such a great job, and all that is needed is to improve their conditions and connect them with the formal system – then why is so much plastic still leaking into the environment? Generally metal waste are more valuable, you know. Because you get better price. And plastics, they are 3 percent of the waste in general and you have different materials within plastic which sometimes for waste pickers are not really very valuable, you know, for collection. And so it is part of what they have. The majority of the waste pickers, they are going to keep collecting plastic. But I don’t think it’s the most valuable in terms of economic gains. Which brings us back to what was once lauded as the benefit of plastic: It’s so versatile and so, so cheap. Which is great for new products, but a problem for disposal. Why not just throw something away, when you can’t really tell what it is and it’s not worth much anyways? So what to do. Can we find a way to give our plastic waste a higher value? First attempts are being made right now, with so-called plastic banks and waste banks around the world. People who collect trash can exchange it for goods or money. The collectors can even get a bank account to start saving up money for the future. Could this be a way to tackle pollution and poverty at the same time? I really wonder if that works – but need to investigate that further. What I learned through my interviews with Jenna, Amy and Sonia is that there are millions of people around the world making a living off of the world’s waste. But especially in Asia it looks like they can’t keep up with the growing heaps of trash. After importing the throw-away culture of the West, do these countries now also need shiny new technology to manage the trash? It sounds like an easy solution, but what would the modernization of waste management mean for the livelihoods of informal recyclers and waste pickers? We will probably need new kinds of approaches. Solutions that consider the cultural context and include the working poor. Which could really make a difference. It’s like, you know, you create the conditions for cross-generational improvement. You know, I can look back, because I’ve been working in my city with waste pickers since 1980s, okay? And I can see the improvement. You can see that the children of the waste pickers that they started to work with back in the 80s, some of them are doing something actually different today because as conditions for their fathers improved, you know, more opportunities were given to their children, you know, outside the wastework – or they are now those that are doing administrative work, you know, their kids are doing the IT work, you know, administrative work of the cooperatives. The integration and organization of waste workers can lift their chances and quality of life. And maybe one day, the kids and grandchildren of these waste administrators could be able to leave the waste sector all-together. Sometime in the future, when our mountain of trash has stopped to grow and started to shrink. So this is how we live, in fact. You know, we need to consume less, we need to reduce waste production. And at the end of the day, of course, this will mean, you know, given that if we are to be more consciously, environmentally minded, this will decrease, you know the recyclables that waste pickers make a living of. And we will have to be better in terms of building capacity for waste pickers to enter new niches. There’s a huge global transformation ahead of us, as we are trying to create a sustainable society for the next generations. It’s an enormous challenge which includes tackling environmental as well as social issues. How can we solve the plastic pollution problem and not cause a social one? That is the big question. This was the Plastisphere with Dr. Jenna Jambeck and Amy Brooks from the University of Georgia, and Sonia Maria Dias of Wiego, a network focused on securing livelihoods for the working poor in the informal economy. Many thanks to them for taking time in their busy schedules to talk to me. The first words in this podcast were spoken by Christophe, a waste worker from Johannesburg in South Africa. The recording is taken from a video on the Wiego YouTube channel. My name is Anja Krieger, and the music was composed by Dorian Roy and Blue Dot Sessions. I’d also like to thank Ines Blaesius, Luisa Beck, and Daniella Cheslow for their thoughtful feedback on various versions of this episode. Karl Urban edited the German version over on RiffReporter.de – thank you, Karl! I hope you enjoyed this episode. Please feel free to send me any questions or comments via e-mail or twitter @PlastispherePod. Support my independent production on Patreon and Riffreporter and find all links are in the show notes. I hope you tune in for the next episode in a couple of weeks. Until then – refuse, reduce, reuse, and recycle. Next PostNext Ep.4: Plastic vs. the Climate?